An action/horror flick; about an immortal witch-hunter, battling an army of witches, in modern-day New York City. 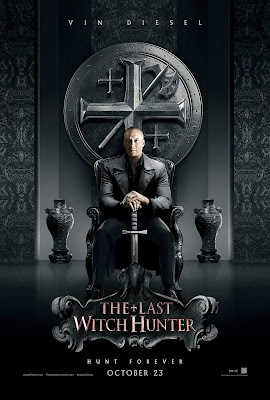 The movie stars Vin Diesel, as the witch-hunter, and it costars Elijah Wood, Rose Leslie and Michael Caine. It was directed by Breck Eisner (who also helmed the 2010 horror flick 'THE CRAZIES', and the 2005 action movie 'SAHARA'); and it was written by Cory Goodman, Matt Sazama and Burk Sharpless (Goodman also wrote 2011's 'PRIEST', and Sazama and Sharpless also co-wrote 2014's 'DRACULA UNTOLD'; a lot of religious themed horror flicks!). The movie is a bit slow-paced and messy, but it's also enjoyable (to a certain extent). Kaulder (Diesel) is an ancient warrior, who killed the deadly Witch Queen (Julie Engelbrecht); centuries earlier. When he did so, she also cursed him with immortal life. So now Kaulder must walk the earth; forever fighting witches, and other demons, while also being haunted by the memories of his dead family (that he can never see again, in the afterlife). His latest mission, is to stop a new deadly force; from unleashing a horrible plague on all of humanity. He finds assistance from a young priest (Wood), and a beautiful witch (Leslie) though. The movie establishes a pretty cool fantasy world; of dark magic, and the way in which it's policed. Diesel makes a prettybadass action hero too. Elijah Wood has now became the male equivalent of a 'scream queen' (it seems like he's in more horror flicks than any other actor right now); he's good in the film as well. Caine is of course always fantastic (but he's above this sort of movie), and Leslie is fun to watch too. The directing is just OK though, and the screenplay is pretty sloppy. The film has some cool action scenes, and some pretty fun ideas, but it's kind of a big mess; when it tries to bring them all together.